French Explorer Henri de Tonti established a trading post in the flatlands along the Arkansas River in 1686 which was the first permanent French settlement in the entire lower Mississippi Region. This trading post was set near a Quapaw Indian Village. 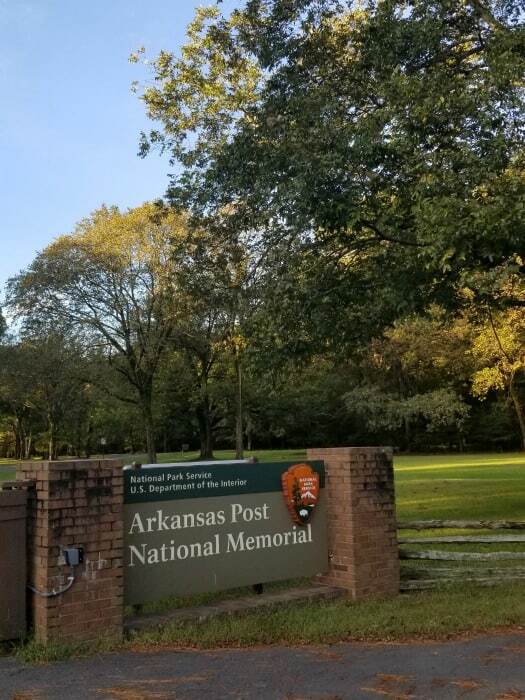 This site is the home of the Arkansas Post National Memorial. Look for alligators and other wildlife in the park. This site has quite an interesting history including military clashes between the French, Spanish, British, Americans, and Confederate forces. By the early 1800s the Arkansas Post became an important river port and the largest town in the region. For a while, it was named the capital of the newly created Arkansas Territory in 1819. In 1863, Union forces attacked a Confederate fort that was established. The artillery bombardment devastated the community. 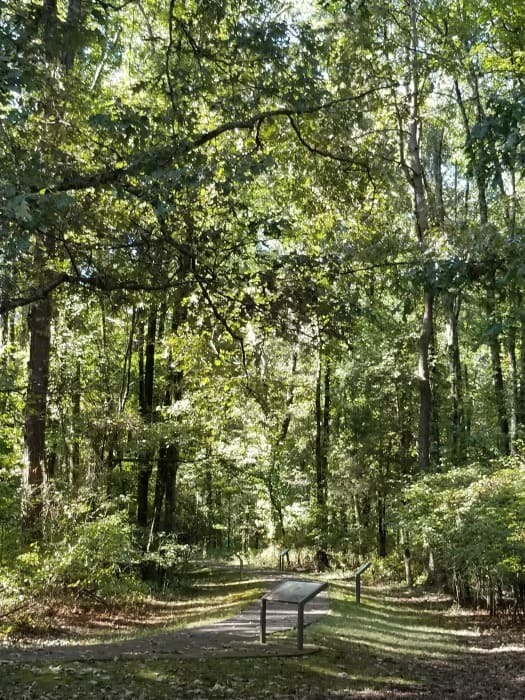 We honestly thought that this park was maybe going to take us an hour to visit and we were truly wrong. This park is absolutely gorgeous. We ended up spending 3+ hours longer at this park than we thought we would and we didn’t feel like we spent enough time exploring. This is one of those parks that just surprise you! When we read about the park ahead of time we thought for sure it would take maybe an hour to get through everything. Trust us when we say you will want to plan a minimum of 3 to 4 hours at this park if not all day. There are so many cool places to explore. From the picnic area with great views of the river to the great walking trails near the lake, this park is well worth exploring. The visitor center is filled with a ton of great information. There are furs you can touch and learn more about fur trading. 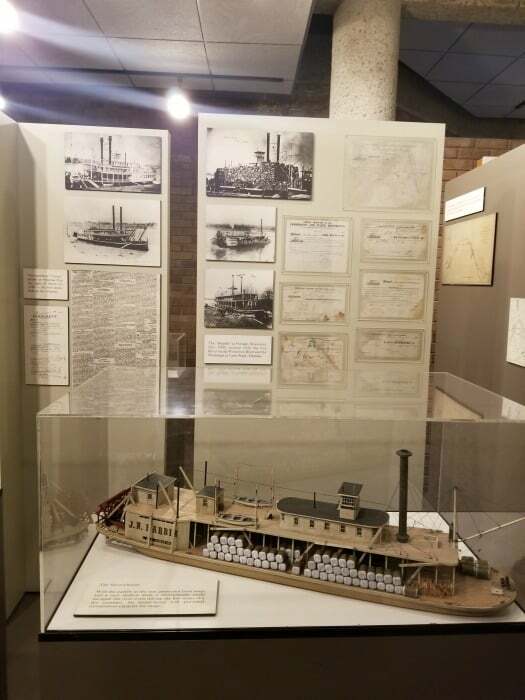 There is also a room that explains the different types of boats that traveled to the Arkansas post on the Arkansas River. The ranger we met was fantastic! He was a wealth of knowledge about the park. He made sure that we truly understood the impact of the Arkansas Post and why it is so important in history. 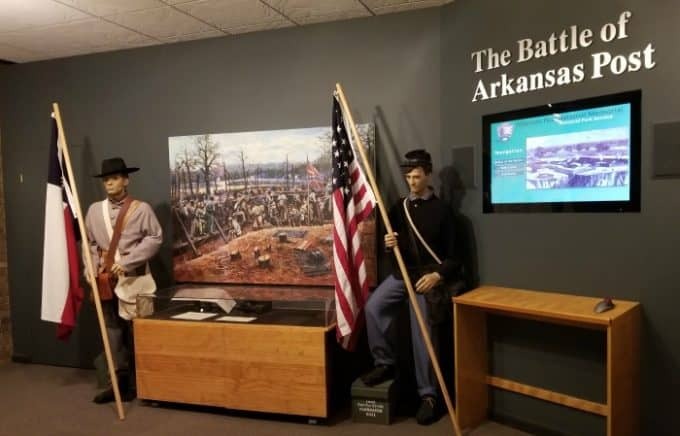 The Junior Ranger program at Arkansas Post includes looking around the visitor center for answers. Many of the answers are also given during the park movie. The ranger can help younger guests find the best places to look for answers if you are not finding them. 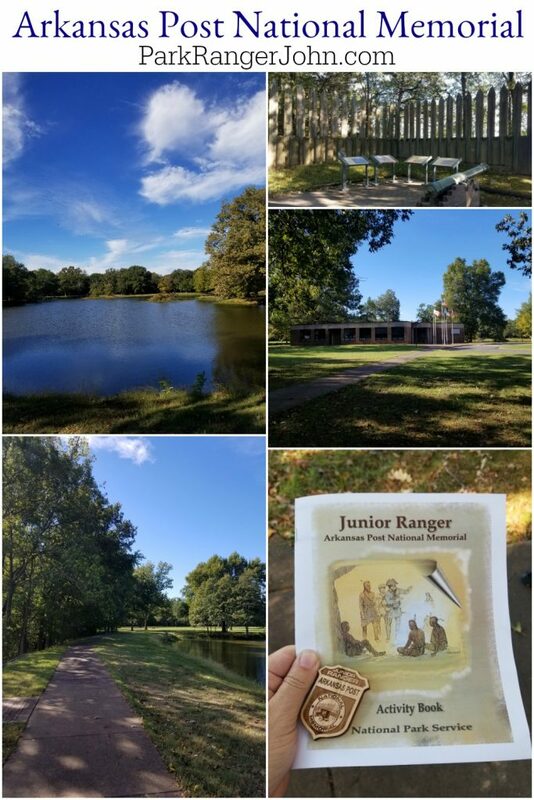 In order to complete the Junior Ranger program you need to watch the park movie and tour the visitor center, take a self-guided tour of the historic townsite or walk the nature trail and complete 5 activities in the pamphlet. Activities include a word search, write a newspaper article about what you learned, a crossword, draw an animal you see and a few fill in the blank activities. The program can be completed by all ages with a variety of options that are included in the booklet. 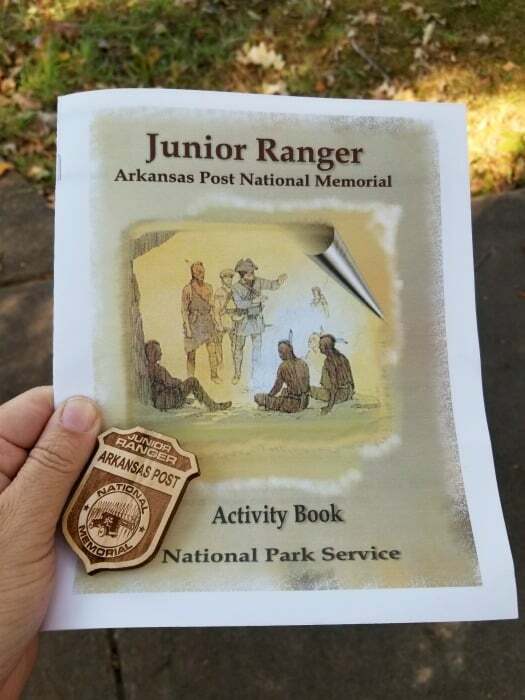 You can download a copy of the Arkansas Post National Memorial Junior Ranger booklet at home here. This is a great way to start learning about the park before your visit. The 20-minute movie is available upon request daily from 8:30 a.m. till 4:30 p.m. We truly enjoyed the park movie. It does an amazing job of explaining the history of the Arkansas Post while still being entertaining. The park also has a 20 minute Trail of Tears video that was really good. Be prepared for this movie to make you really think about our US History and what was done to the local tribes of Native Americans. 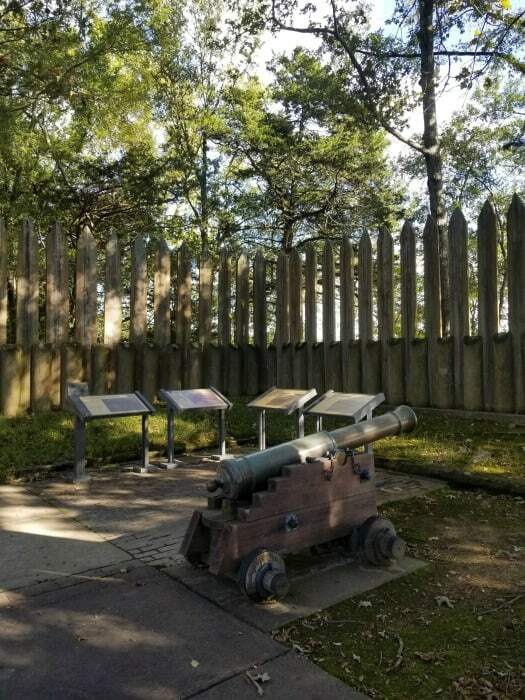 Wander the 2-miles of trails through the historic town site and hardwood forest. The majority of the trails are paved and easy to maneuver. There is a grass trail that may get soggy depending on the weather. The trail that leads around the pond/lake is gorgeous. So easy to walk and absolutely beautiful along the Arkansas River. We saw quite a few White-Tailed Deer when we pulled into the visitor center parking lot. The wooded areas of the park and waterways are great places to look for birds. Musket and Cannon demonstrations are regularly scheduled make sure to check the park calendar for current events. 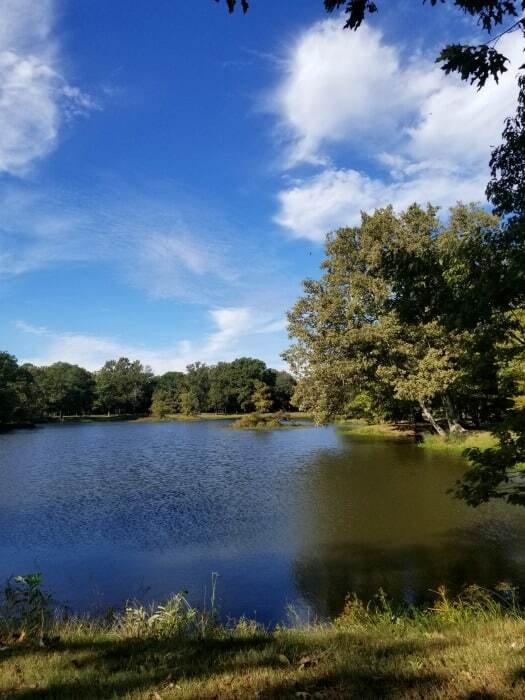 Fishing is allowed in all the waters in and around the park; however, an Arkansas fishing license is required for individuals 16 years of age and older. We heard that on weekends during the summer the Rangers will take groups out on canoes to explore more of the park. If you are visiting the park make sure and check in at the visitor center and ask if they are offering canoe rides during your visit. 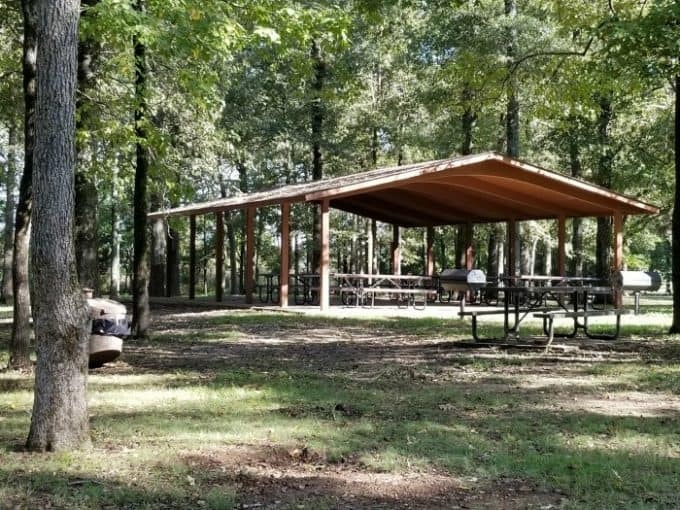 Arkansas Post has a beautiful picnic area with barbecues, picnic tables, and a covered shelter. We were so sad that we hadn’t brought lunch with us to enjoy this beautiful picnic area. You can have lunch with a view of the river. Arkansas Post became a state park in 1929. 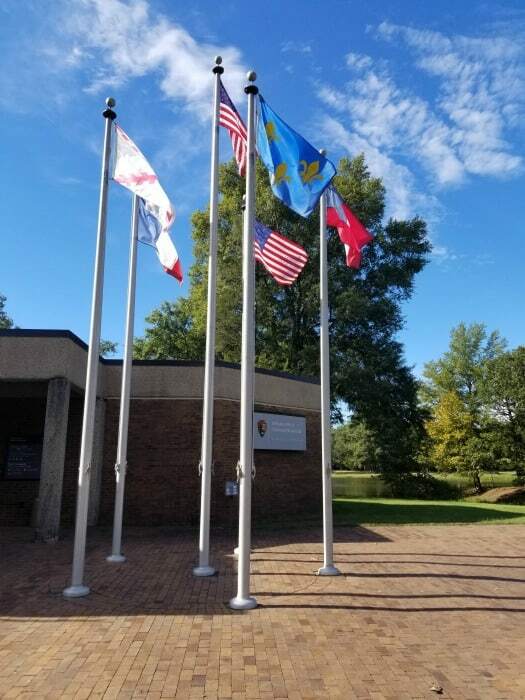 In 1960 Congress designated it a national memorial. Walkways, buildings, and most trails are wheelchair-accessible. Pets must be on a leash or physically restrained at all times. Alligators and snakes live here, including three species of poisonous snakes: water moccasin (cottonmouth), copperhead, and pigmy rattlesnakes. The park is a drive! Make sure you have gas, snacks, and water with you. There is a Love’s Gas Station along the way but not a ton else that we passed. It may depend on which direction you drive in from. The visitor center is closed Thanksgiving Day, Christmas Day, and New Year’s Day.